Wendy’s says it plans to install self-ordering kiosks at about 1,000 locations by the end of the year. A typical location would have three kiosks, The Columbus Dispatch reported. Higher-volume restaurants will be given priority for the kiosks. 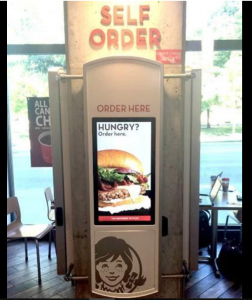 Wendy’s chief information officer, David Trimm, said the kiosks are intended to appeal to younger customers and reduce labor costs. Kiosks also allow customers of the fast food giant to circumvent long lines during peak dining hours while increasing kitchen production. Trim estimates the company will see a return on its investment in less than two years. Kiosks are also valued by the Dublin, Ohio-based company for their ability to provide data about customers.